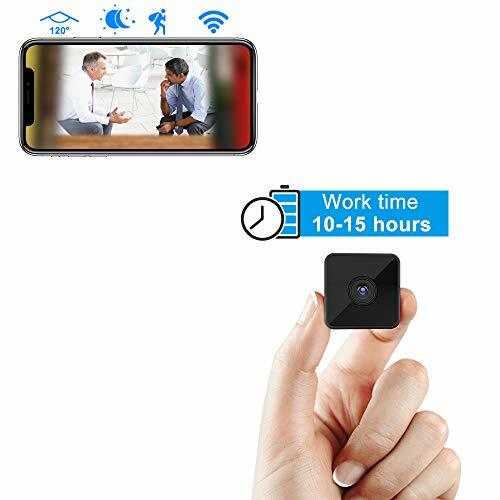 Portable 2MP Mini Size Hidden Camera: 1080P HD live streams. Portable for car recording, vacation home monitoring. Simple self-install home monitoring in minutes; easy control wireless cameras with free iOS & Android apps; Portable pet/baby monitor allows you to place and move your wireless camera anywhere inside your home or office. Powerful Battery Power Capacity: Support up to 64GB micro SD card, with built-in 3000mAh battery power to support up to 12 hours video recording per full charge. powered by 2 Lithium AA 1.5v non-rechargeable Lithium batteries (included), data is sent from Surveillance camera over Wi-Fi. Smart Motion Detection: Support motion triggered video recording with alert push to APP to keep you well informed of any suspicious movements around the monitoring area. Once motion is detected, you will receive notification immediately. Easy Remote Access: Support different users viewing the camera at the same time via multiple phones/tablets/computers. Pair the camera to your local wifi, then you can access the cam any time anywhere. With two-way audio function to talk with those on the camera’s side to say hello or deter suspicious strangers. Advanced Invisible IR Light Night Vision: With advanced Invisible IR light for up to 50ft/15m night vision distance. Being in complete darkness, the camera still provides clear images. And no one will notice there is a camera there.